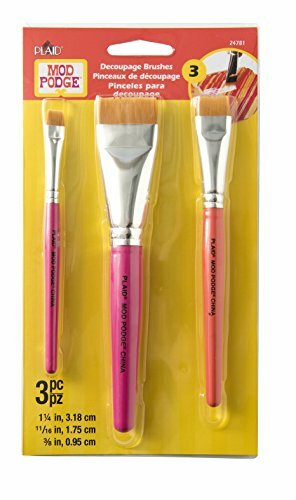 Whether you're embellishing a gift box or smoothing your work across a canvas, this 3-Piece brush set can help you achieve impeccable results. The set includes three brush sizes: 1/2", 3/4", and 1 1/8 inch - perfect for anything from fine detail work to larger art pieces. The short gold Taklon bristles are ideal for ornate surfaces, and make pressing paper or fabric into creases and tight corners a breeze. These brushes are excellent for projects that require fewer visible brush strokes - optimal for high gloss and flat matte finishes. The brushes clean up readily with soap and water. For best results, be sure to reshape the brushes after washing and before standing brush-side up to dry.